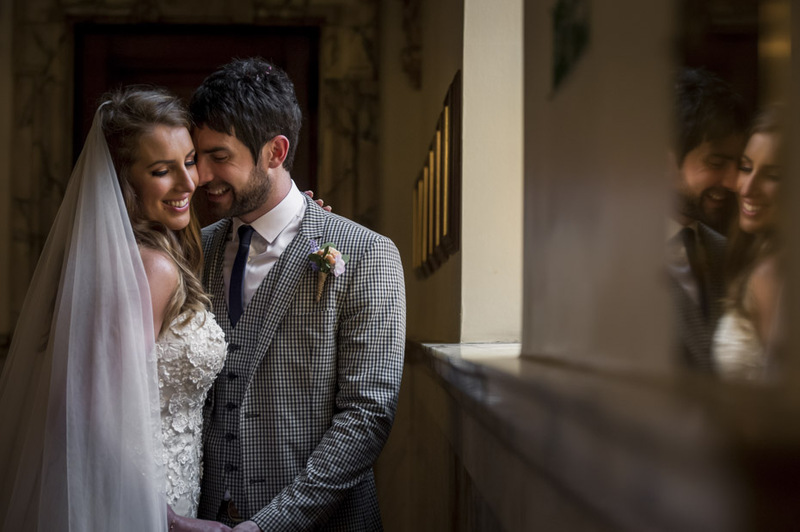 At Stockport’s Town Hall Katie and Simon said their vows to each other. Known as ‘The Wedding Cake’, Stockport Town Hall is a Grade II listed building, which features a stunning tiered clock tower crowing the entrance. This premier venue was perfect for their amazing wedding day. This is the first time I have photographed a wedding at Stockport Town Hall, it was great to be somewhere different and fresh. Katie, along with her 4 Bridesmaids, got ready at her mums house and enjoyed the morning together. Her Bridesmaids wore knee length dresses with a floral strap over one shoulder in a soft pink colour. Katie wore a beautiful full length wedding dress with floral lace detail and a tie up back fastening. With finishing touches of a long white veil. She walked down to meet her father and greeted him with an emotional hug – A father and daughters special moment of the day. We took the opportunity to take the morning wedding photos of Katie and her Bridesmaids all together. Their beautiful flowers were a mixture of Soft Pink, Lavender, Fuscia, which matched stunningly with their dresses. The groomsmen wore Dark Navy tailored suits with bow ties and waistcoats. Simon wore a Black, Blue and Creme checked tweed style suit with matching waistcoat and tie. From the top balcony, on each side there were 2 sets of stairs which met in the middle where Simon was waiting. The Bridesmaids walked each down both set of stairs and then Katie made her grand entrance. She met Simon in the middle where they said their vows on the marble and cast iron staircase, with all their friends and family seated at the bottom looking up to them. This venue along with the architecture is truly beautiful, I made sure there was a good choice of wide wedding photographs to captured this beautiful building. It’s interesting being a Stockport wedding photographer for the day, it’s good to be away from the usual landmarks and getting your thinking cap on to create some new wedding photographs at Stockport Town Hall. After their ceremony, Simon and Katie went back to her parents house, a stunning bungalow style house in Mill Hill Hollow. Overlooking Cheshire’s Countryside, it meant so much to Katie to have her photos taken where she grew up. It was such a beautiful day with the sun beaming down on the garden. After which they were greeted by all their wedding guests for a reception at Bowden Rugby Club. Katie and her mum decorated the room themselves and as you can see, the room looked stunning.